At the reception desk I was handed a small Unreal-branded bag containing a pen and a folder of advertising brochures that I shuffled through briefly. 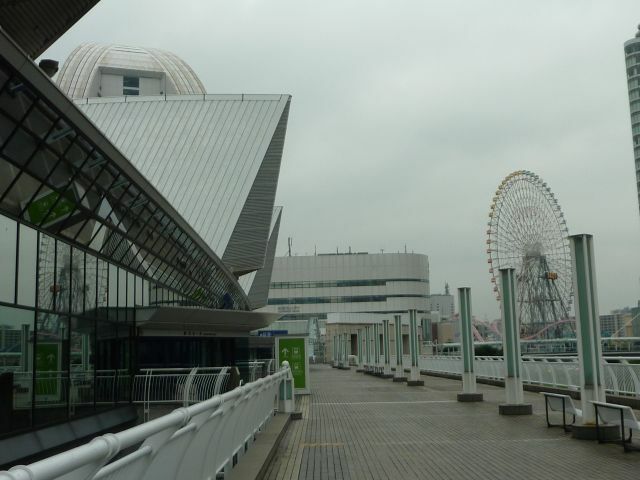 At the time I arrived, talks were in progress behind closed doors in the presentation rooms, so the company booths outside were fairly free of people. A cursory loop of the floor & check of the schedule confirmed that YS Net didn't have a presence at the event - as expected. I hadn't yet come across any as obvious as a pile of Shenmue leaflets on the table at any of the stalls, so I tried asking a couple of staff members dotted around the hallway. Their faces went blank at the mention of "YS Net" and "Yu Suzuki" so I could tell I would have to find another way. Get your Unreal T-shirts here. It was at that moment that the word "Shenmue" floated across to me from a couple of young Japanese guys chatting nearby. I seized the chance and said hello. 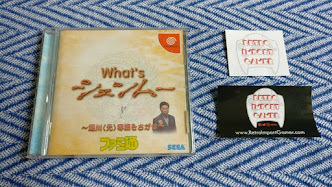 It turned out that one of them was a Shenmue fan, who had just been explaining to his friend what Shenmue was. He seemed interested to hear that there was a strong global community, and was only too happy to point me to where the Shenmue leaflet could be found - there it was, inside the folder of brochures in the bag handed out at the reception desk. It my haste I must have flipped right past it. D'oh! 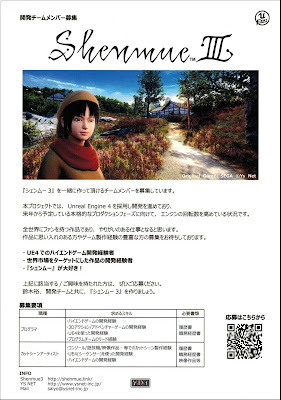 The Shenmue leaflet - Unreal logo at top-right. 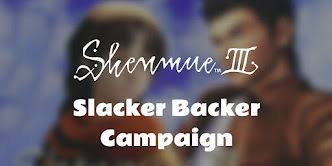 The first thing that catches the eye at the top is the use of the "traditional-style" Shenmue III logo, rather than the plainer non-cursive version. Looking as good as ever. Beneath that is an image of Shenhua (still with the early testing model) standing in an area of Bailu village. Is this a new image? It seems to be a slightly different area than those seen before in the trailers or screenshots - feel free to leave your thoughts on this below the post. And now to the text of the page itself. We are recruiting for team members to create Shenmue 3 with us. Unreal Engine 4 has been adopted for the development in this project. In preparation for the full production phase scheduled next year, we are now revving up the engine. 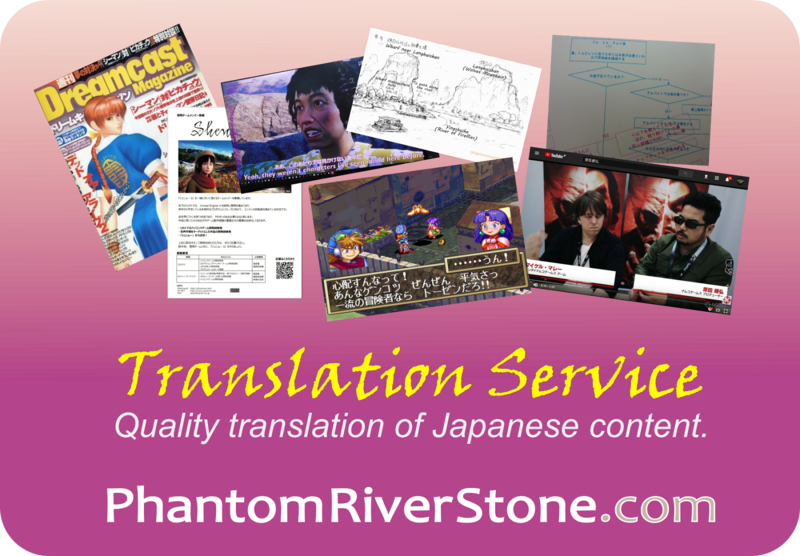 This is a game that has fans the world over, and I think you will find the work rewarding. Applications are welcomed from people who have strong feelings for the game, and those with a wealth of experience with game creation. If the above apply to you / take your interest, by all means please apply. 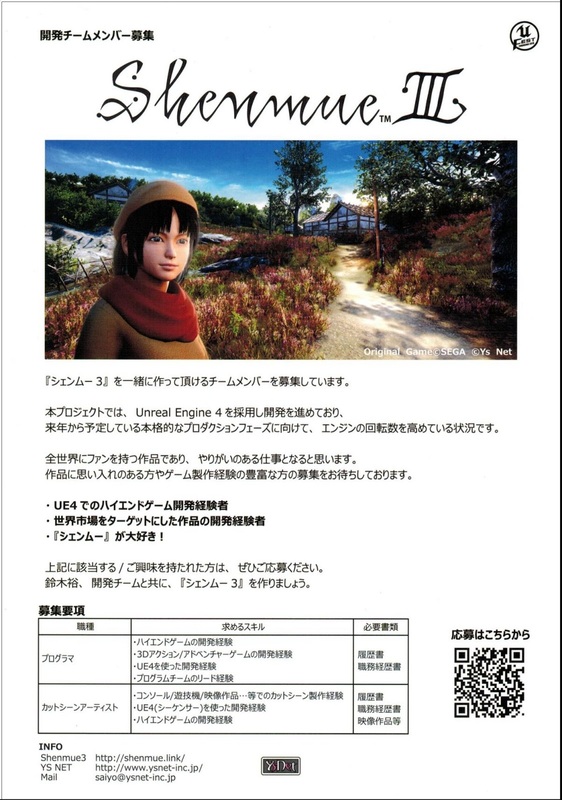 Together with Yu Suzuki and the development team, let's create Shenmue 3! Yu's emphasis on the applicant being a fan of the series really comes through here, just as strongly in fact as the technical requirements! The word "high-end" is also used a few times through-out - which I take to refer to "AAA" type games, those at the highest level of budget and promotion. It makes sense for additional weight to be added to the core development team and for the cut scenes, following the prototyping that has been carried out in the earlier stages of the project. Although it's a minor item, it is a reassuring confirmation that the project is (to continue with Yu's engine metaphor) now moving up a gear. and yeah! thats an image that i never saw before! Good to know! Seems it could indeed be new. I think Shenmue 3 will be amazing.